Safari Adventure Club House Castle 13"x15"
No worries enjoy your party. Busy kids make great Parties! 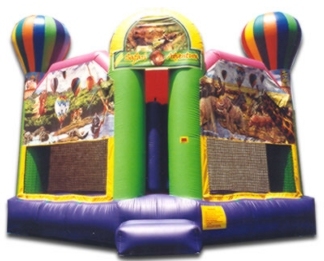 This jumping castle has beautiful mural scenes of the wilderness and wild animals. This Bouncehouse will challenge children to see a new world. This world they imagine is teaming with all the wonderful gifts nature has for us. All in their own special clubhouse.